The hotel is dressed to impress throughout during the Christmas period, with classic style and luxury. This year’s theme is ‘Christmas in Carmarthenshire’ – from sumptuous menus themed using the finest local ingredients to the rustic decorations, a sense of Wales will be apparent throughout. An extremely popular group destination over the Christmas period due to the friendly, ‘home from home’ atmosphere created by the friendly team of staff at the hotel. Stay in luxurious bedrooms and enjoy fine dining with locally sourced ingredients, visit some of the fantastic heritage sites nearby and enjoy traditional Welsh choirs. You can choose from a 2 or 3 night Christmas package or create your own. Guests staying with us on Christmas Day wake up to a luxury gift outside their door and another if joining Christmas Day Lunch. 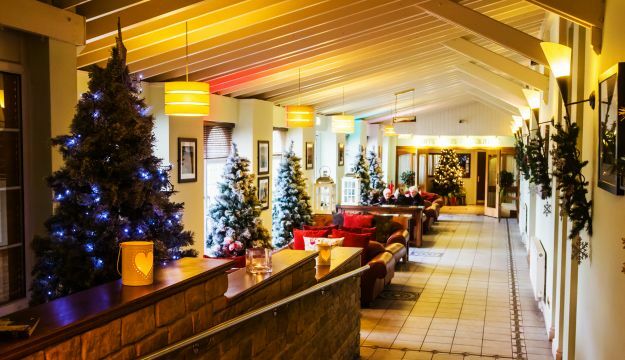 Come and experience the wonderful atmosphere enjoyed by many at Stradey Park Hotel this Christmas and New Year’s. Discounts are available on larger groups. Stradey Park Hotel is a TripAdvisor Certificate of Excellence holder, awarded to hotels that achieve a high standard consistently. Request a Christmas brochure for full details of what’s going on at Stradey Park Hotel and around Carmarthenshire this Christmas. Spoil yourself this Christmas at Stradey Park Hotel.